More online Americans are using video-sharing sites–and they are doing so more frequently. 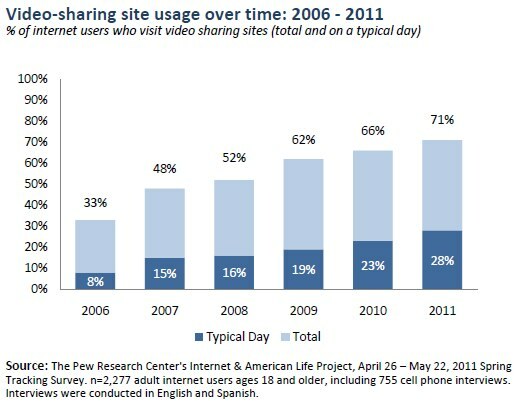 As of May 2011, 71% of online adults reported watching videos on a video-sharing site such as YouTube or Vimeo. 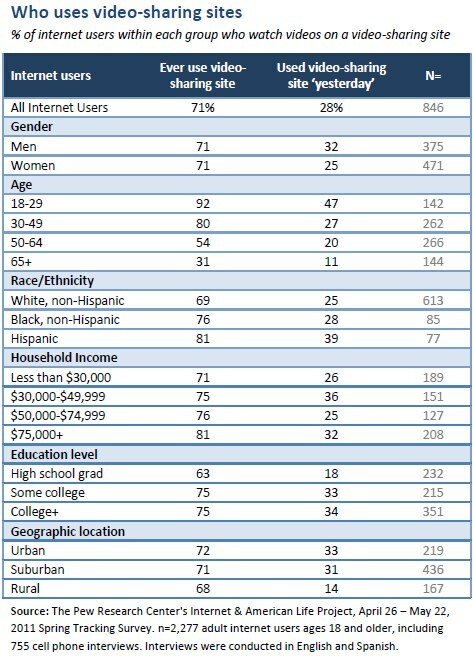 A demographic portrait of these site users is in the table below. That represents a 5-percentage point increase from the 66% of online adults who reported being video-sharing site users a year earlier and a 38-point increase from five years ago when the Pew Internet Project took its first reading on use of such sites. Moreover, the use of video-sharing sites on any given day also jumped five percentage points. In our May 2001 survey, 28% of online Americans said they had gone to such sites “yesterday,” compared with 23% who had reported using video-sharing sites “yesterday” – or on a typical day in May 2010. Rural internet users are now just as likely as users in urban and suburban areas to have used these sites. Some 68% of rural internet users have gone to such sites, compared with 71% of online suburbanites and 72% of online urban residents. Those are statistically insignificant differences and show that since 2009, online rural residents have caught up to others in using these sites. 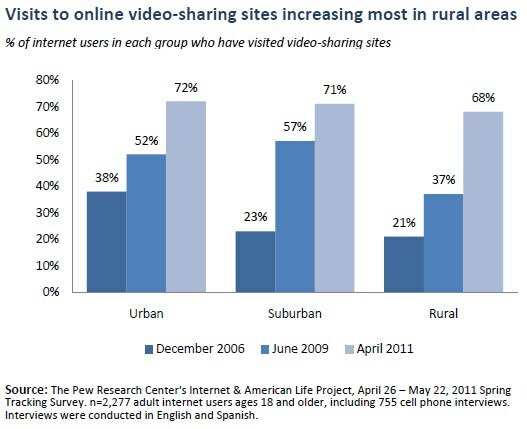 At the same time, rural internet users are still less likely to be visiting video-sharing sites on a typical day (14% vs. 31% and 33% for suburban and urban residents, respectively). Overall, 69% of white internet users said they had visited video-sharing sites, 13 points higher than in April 2009, and more than double the 31% reported when the question was first asked in December 2006.2 At the same time, 79% of online non-whites — African-Americans, Hispanics and others – reported using video-sharing sites. That figure is 12 points higher than April 2009, and 41 points higher than in 2006. Some 81% of parents in the survey reported visiting video-sharing sites, compared with 61% of the non-parents. Parental use increased 9 points from 72% in May 2010, while non-parental use dipped slightly from the 63% reported in the same survey.3 This increase might also be attributable to the fact that parents with minors at home are younger as a group than the non-parents cohort and use of video-sharing sites is linked to younger users. The rise in use of video-sharing sites is at least partly being driven by the growth in content on sites like YouTube and by user contributions. The rise in use of video-sharing sites is at least partly being driven by the growth in content on sites like YouTube and by user contributions, which then possibly encourage site visits by contributors’ friends and others who pass around links about popular amateur videos. The latest statistics from YouTube are that 48 hours of content are uploaded every minute to the site and the range of contributions is striking. YouTube lists 28 different categories for channels of video that are contributed and dozens of subcategories ranging from automobiles and gaming, to activism and politics. YouTube viewership has grown from 8 million views a day by the end of 2005, to over 3 billion views a day in 2011, according to the company’s data. The company receives over 200 million views a day via mobile connections. Pew Internet has not gotten a comprehensive reading recently on every kind of user-generated video but the Project did ask about mobile devices and video in May 2011. Some 34% of the cell phone owners in the country have shot video with their phone; 26% have watched video on their phone; and 22% have posted videos or photos online. Cell-phone owning men are more likely to watch videos on their mobile devices than women, but both sexes are equally likely to record and post videos. Much like general online group who visit video-sharing sites, blacks and Hispanics have significantly higher proportional viewership on their cell phones. In addition, they are more likely to record a video, and more likely than whites to post a video.